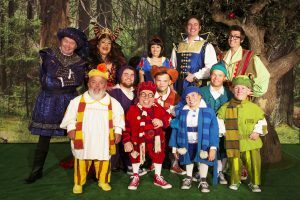 FILM and TV star Warwick Davis joined comedy favourite Andy Ford and award-winning magician Chris Cox to promote their version of this year’s panto, Snow White & the Seven Dwarfs, at the New Victoria Theatre in Woking. Warwick will be playing head dwarf Prof, while Andy will appear as Herman the Henchman and Chris will be taking a turn as Muddles. Others in the cast include Anne Smith as the evil Wicked Queen, Shaun Dalton as the royal Prince and Melissa Potts in the lead role as Snow White. Warwick’s gang for the picture included panto players Annabelle Davis, Peter Bonner, Simeon Dyer and Jon Key, while Ray Griffiths and Harry Jones stood in for Hayley Burroughs and Harrison Davis who could not make the photo shoot.